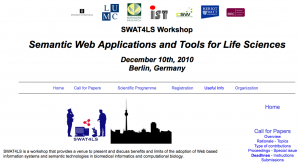 The 2010 edition of SWAT4LS was held in Berlin, Dec. 8-10th 2010. It was articulated over a one day hackathon (Dec. 8th), a one day of tutorials (Dec. 9th) and a one day workshop (Dec. 10th). The full program of the 2010 edition of SWAT4LS is available on the workshop original website.